In the view of CPTAFE Secretary General Dr. Morissanda Kouyaté, Guinea is at a critical juncture regarding FGM. Awareness of the detrimental effects of the practice is widening; further, as the successive dépots de couteaux have shown, the possibility exists for consensual, communal change. Participatory video offers a lively means of strengthening outreach efforts, amplifying the effect of recent achievements, and supporting long-term behavior change through the dissemination of positive models. Together, CPTAFE and C4C developed a two-phase plan to equip and train five regional participatory video teams—one for each of the country's four geographical regions and one for the capital, Conakry. The goal of the project was to support CPTAFE's anti-FGM mission and to promote the welfare of women, girls and youth through use of community-based communication activities. The first CPTAFE/C4C workshop in participatory video took place in early July 2002. Twenty-one participants—seven from each of the designated Phase I regions—took part in the 12-day training. They included CPTAFE members and community-based supporters: among them, two representatives of the organization's Executive Committee, presidents and key members of the regional committees, rural radio journalists, teachers, youth, and several former excisors who participated in the laying-down of knives and who now actively advocate against the practice of FGM. The training began in Conakry. Over the first few days, the participants became familiarized with the video equipment and viewed and discussed examples of video work that has supported health, human rights and social change goals. As the workshop progressed, they honed their "active listening" and interviewing skills, practiced shot identification and "storyboarding," and carried out increasingly challenging shooting exercises. In particular, participants developed team skills in program planning, essential for the sequential shooting and "in-camera editing" approach most favorable for community-based work. Ideas for initial video productions were honed in the context of existing regional plans for anti-FGM activities. Subsequently, participants separated into their 7-person regional teams. The two teams from the interior returned to Middle and Upper Guinea with their video equipment (a super-VHS camcorder, microphones, headsets, a small TV/monitor for field use, a VCR, a full-sized TV/monitor, a small generator, video tape supplies and accessories). Each regional team was accompanied by two members of the Conakry team and a C4C video trainer. Video activities subsequently continued in the two interior regions over the course of eight days, with participants engaging community members in collaborative video productions, ranging from mini-dramas to documentaries incorporating poetry and musical performances. Each team produced three videotapes and conducted three community "playbacks" followed by team-facilitated discussions. Of these first productions, the majority addressed the practice of female genital mutilation, though in different ways, for various audiences. The Middle Guinea team filmed one of their programs in Dalaba, the home village of two team members and the site of a CPTAFE-sponsored dépot de couteaux. The video team interviewed members of women's groups as well as former excisors who had recently joined local gardening cooperatives, showing various ways in which the former excisors are developing alternative sources of income. 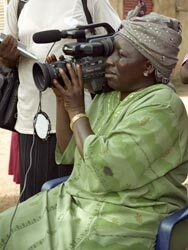 In Upper Guinea, by contrast, team members filmed two short dramas intended to persuade family members to abandon FGM. The scripts were based on the first-hand knowledge of team members; the actors included friends and relatives, as well as health personnel and former excisors. In one drama, a grandmother is determined to have her granddaughter excised during the period of summer vacation—an all-too-realistic scenario, based on the actual experience of one young team member. Eventually, the grandmother is convinced by trusted peers that excision poses a threat to her granddaughter's well-being. Local playbacks sparked appreciative comments on the clarity of the anti-FGM information delivered in the video, as well as on the presence of a widely respected community figure in the role of the grandmother who finally renounces the practice. Positive modeling, both on-screen and off, proved a powerful ingredient in the receptiveness of community members to the video teams' messages. The community playbacks elicited many highly personal comments from viewers. In Dalaba, one man spoke of the death of his young niece following her excision. A woman described the problems she has experienced with a vesico-vaginal fistula. In Kankan, Upper Guinea, one young woman stood and said that she wished she could restore what had been taken from her when she was excised. One mother expressed deep regret at having excised her daughter; another woman stated, "We were victims, but our daughters won't be." During each playback session, the video teams invited community members' ideas for future videotapes, as well as for outreach activities that could advance CPTAFE's mission and promote community welfare. It was only a matter of minutes before the main message of the Video Sabou et Nafa project reached beyond audience members. The video team in Kankan, Upper Guinea, had just screened its first two productions before an attentive audience of local women. A lively discussion had followed, with viewers voicing their approval of the realistic way anti-FGM messages were conveyed through the locally filmed mini-dramas. After gathering audience members’ ideas for future productions, the team members had thanked them and brought the session to a close. A few minutes later, a woman who had attended the screening hailed a man who was passing by on a motorbike. The man, who was from the same village outside Kankan as the woman, listened as she described the videotapes she had just seen and the compelling anti-excision information they contained. "We need to talk about this [the negative effects of excision] at the next village meeting," the woman said. "Maybe we can bring these videos to show people." To the video team member who overheard the exchange, it was a vivid example of the power of locally made media. In addition to the anti-FGM videos that were produced during this time, the Upper Guinea team also made a program on various income-generating projects initiated by local women, underscoring the social and economic benefits that resulted for both the individual women and the community. The name Video Sabou et Nafa was chosen by project participants through consensus. The words sabou and nafa are shared by all three of the key languages spoken by team members - Malinke, Poular and Soussou - and signify, respectively, "opportunity" and "benefit." The title reflects the many opportunities enabled through use of local video, and the beneficial changes this resource can help bring to communities throughout Guinea. In 2003, the project teams gathered in Conakry for a follow-up workshop and training of trainers session; designated participants subsequently travelled to the Lower and Forest regions of the country to train new teams in those sites. In December 2004, the teams met once more to exchange experiences of the past year, screen their recent work, and reflect on the project’s impact on their lives and their communities. Over the course of the project, the teams created over 30 local-language videotapes on topics including family planning, girls’ education, infant nutrition, teen pregnancy and early marriage as well as FGM. In addition, a Video Sabou et Nafa team produced a documentary for the American Refugee Committee on gender-based violence prevention, response and legal aid activities benefiting refugee women in the Forest Region. This videotape was shown during a U.S. Congressional briefing on gender violence in conflict settings. This project has contributed a great deal to the community — notably, consciousness-raising and exchanges of experience between different groups. The greatest satisfaction that the project gave me is having a good training in video, and a lot of hope for the future and [our] collective work. The Video Sabou et Nafa Project was funded by the Public Welfare Foundation, the Richard and Rhoda Goldman Fund, the American Jewish World Service, UNFPA/Guinea and USAID.